Contrary to popular belief, testosterone is not the most anabolic hormone in the body. That title belongs to insulin. However, insulin can drive two very different types of growth. Since the hormone signals for general tissue growth, it is responsible both for driving muscle gain AND fat gain. Obviously, one effect is more desirable than the other (and I certainly hope I do not have to tell you which one). If you hope to manipulate the effects of insulin to your advantage, it becomes necessary to increase your insulin sensitivity. Increasing your sensitivity to insulin results in less body fat storage and an increased ability to build muscle. 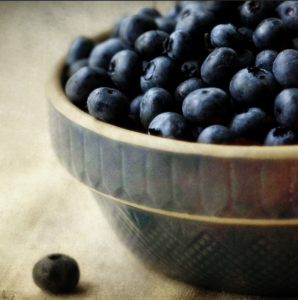 So, what does this powerful hormone have to do with blueberries? Has Shomo gone crazy? Did he lure me into reading this article by proposing that a tasty snack can make me muscular? Well, a recent study (cited below) actually illustrated that supplementation with the bioactives from blueberries improved insulin sensitivity in insulin resistant individuals. Researchers gave obese participants two blueberry smoothies per day for six weeks and monitored their insulin sensitivity. It was found that about two-thirds of the participants demonstrated at least a 10% improvement in this metric! So, for a gymgoer that is focused on building muscle, blueberry incorporation can result in less fat storage and greater muscle building over time. Try adding blueberries to a few of your shakes throughout the day (I usually buy large bags of frozen blueberries from the grocery store and throw a few handfuls into my post-workout shake). Or, you can find a supplement that contains blueberry concentrate and simply use that as prescribed. Regardless, it is beneficial to understand that using this superfood can do a great deal to improve how your body utilizes insulin to build the kind of tissue you’ll be able to flex at the beach! Cited Study: Bioactivesin Blueberries Improve Insulin Sensitivity in Obese, Insulin-Resistant Men and Women. April J. Stull, Katherine C. Cash, William D. Johnson, Catherine M. Champagne, William T. Cefalu.